Acute phase protein levels increase in blood and other bodily fluids as a result of inflammation, tissue injury and disease. They are used as biomarkers of disease in humans, companion animals, livestock and species used in preclinical research. When selecting an acute phase biomarker it is important to appreciate that a good biomarker in one species is not necessarily useful in other species. For example, C-reactive protein (CRP) can increase as much as 1000-fold in humans and dogs but it increases by only 50% in rats. Please contact us if you would like advice regarding biomarker selection. We currently manufacture ELISA kits for measurement of acute phase proteins including CRP, haptoglobin, hemopexin, alpha-1 acid glycoprotein, clusterin, alpha-2-macroglobulin, serum amyloid A (SAA) and serum amyloid P (SAP) in species including but not limited to mouse, rat, rabbit, cat, dog, pig, cow, chicken, and monkey. Data that illustrate the use of our kits to measure acute phase proteins in mouse and rat inflammation/infection models can be found here: mouse, rat. Literature references that describe the use of our kits are listed at the bottom of this page. *The bovine haptoglobin kit works with serum, plasma and milk samples. 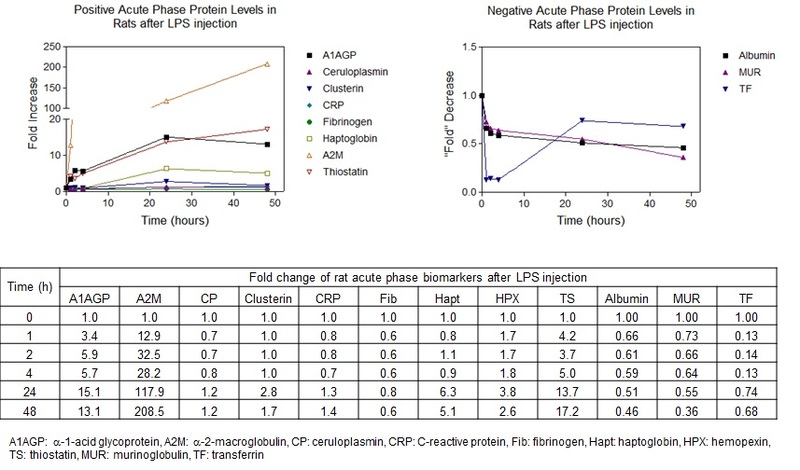 The figures and table below illustrate the serum levels of acute phase proteins in lipopolysaccharide (LPS) treated rats using ELISA kits manufactured by Life Diagnostics, Inc. Sprague Dawley (~200g) rats were injected (i.p.) with 1 mg/kg LPS in saline. At the times indicated, blood was drawn and serum prepared. Acute phase protein levels were evaluated using LDI ELISA kits. Data are illustrated as fold-change relative to baseline values.